William Dalrymple has published a piece in The Guardian newspaper on the Sabarimala pilgrimage. This was the very pilgrimage I recently traveled to witness and wrote about in a Project Update post called Where Muslims Warriors Defend & Protest Hindu Gods. His essay arrives a few days ahead of my own. I am however posting the full text of his piece here. Stay tuned for my own essay which will dwell deeper into the myths and histories that inform this remarkable gathering. The pilgrims were winding their way slowly uphill along corkscrewing mountain roads, heading up into the foothills of the ghats. On one side stretched neatly manicured hillsides of tea estates, on the other, rubber plantations. Far below, the cultivation terraces fell away to the flat plains, where a deep green carpet of coconut palms stretched as far as the blue of the sea. The border between the two was marked by a thin strip of blazing white sand. The pilgrims snaked along the sides of the roads: long files of dark, wiry men in black lungis, bare-chested and barefoot, with bundles of clothes on their heads and staves in their hands. 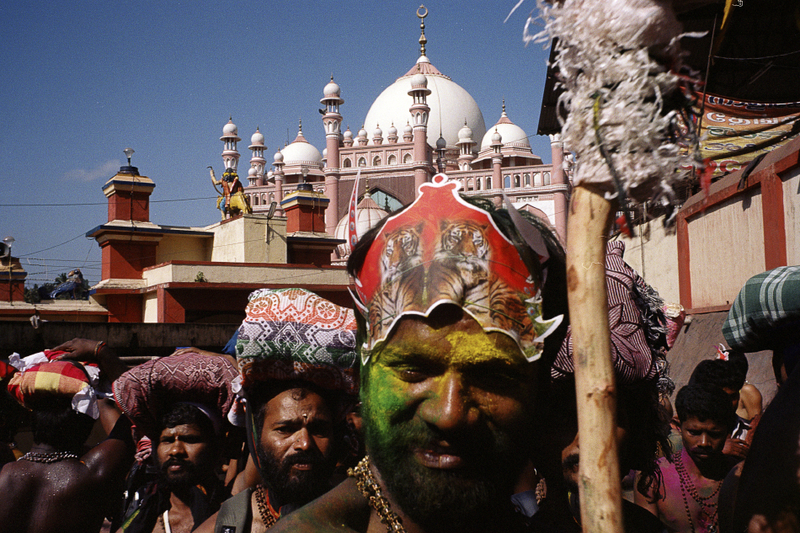 The pilgrims explained that they were taking part in the largest pilgrimage festival in southern India. Every year, from mid-November to mid-January, between 10 and 50 million men leave their villages in the south of the country and trek on foot to pay homage to the shrine of the demon-slaying Lord Ayyappa at his mountain top abode of Sabarimala in Kerala’s Western Ghats, south-east of Kochi (Cochin). Here the god, who is formed from the union of the two most powerful deities in Indian cosmology, Shiva and Vishnu, is worshipped as a celibate ascetic meditating in remote mountain forests for the benefit of all mankind. In keeping with this spirit, all the pilgrims take vows of celibacy and purity, growing a beard and eating only the simplest fruit and millet from the forests. The shrine of Sabarimala is an extraordinary sight at festival time, alive with tens of thousands of pilgrims queuing to do darshan â€“ catch a glimpse of the idol of their deity. But it was one of the major staging posts on the way to Lord Ayyappa’s shrine that for me was more extraordinary than the final destination. The cult of Lord Ayyappa is notable in that it recognises no distinctions of caste or creed. All pilgrims eat and travel together; and more remarkably still, at the small hill town of Erumeli all the pilgrims â€“ the vast majority of whom are Hindu â€“ pray not only at the temple but also at the town’s mosque. They do this in memory of the legendary assistance given to Lord Ayyappa by a Muslim warrior named Vavar. In a country that sometimes seems irreparably divided along lines of religion, this was something remarkable. The mosque, when we finally got there, lay in the centre of Erumeli. Everywhere barefoot devotees choked the streets, haggling at the stalls selling fresh king coconuts. But the scene around the mosque was more chaotic still. Pilgrims were pouring out of a pair of ashrams opposite, covered in leaves and twigs and greenery, and painted with tiger stripes of yellow and blue. Some were wearing tiger masks, others silver crowns. In this dress, ecstatically laughing and cheering, chanting and singing, they ran and danced rather than walked into the mosque. Here they began rapidly circling the ambulatory that runs around the mosque’s prayer hall. At one point on their circuit, some of the pilgrims took coconuts which they had bought in the bazaar and threw them at a wall. The coconuts shattered and fell in pieces into a special pit below. “It doesn’t sound very Islamic,” I said.